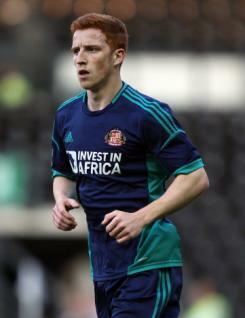 Jack Colback is a combative midfielder for Sunderland. Jack signed for the Black Cats at the age of 11 and came up through the club's youth system before joining Ipswich Town on a season-long loan in August 2009. The youngster became a regular for the Portman Road side, and capped a productive 2009-10 season by being voted the Players' Player of the Year by his colleagues. Jack was recalled from the loan following Town's last game of the campaign and made his Premier League debut for Sunderland at Wolves in May 2010. He added to his first-team experience with a further two-month loan spell at Ipswich from October 2010 and on his return to the Stadium of Light he featured from the bench again in the draw with local rivals Newcastle United in January before ending the season with a short run in the line-up, producing some impressive displays.